This spring Macy Burnham invited Bob Buckridge, Thad Ivey and I to come down to Cali for a week of fun and sun, so we loaded up my truck and headed south. We stopped at Nugget falls for some park and play just for fun on the way down. I recommend stopping at Nugget because it is a fun way to break up the drive. We got to Kernville, California late at night. Along the way we ran into a couple of very cold motorcycle riders on the shockingly snowy pass just outside Kernville. The motorcyclists made it up the pass but could not get down. They had to sleep in a public bathroom on the pass, and we offered help but none was taken. 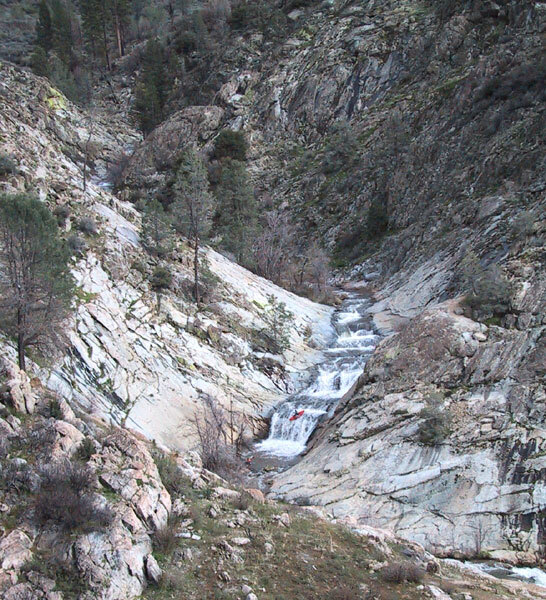 We camped just outside of Kernville next to the Kern River. Our campsite, just outside of Kernville. 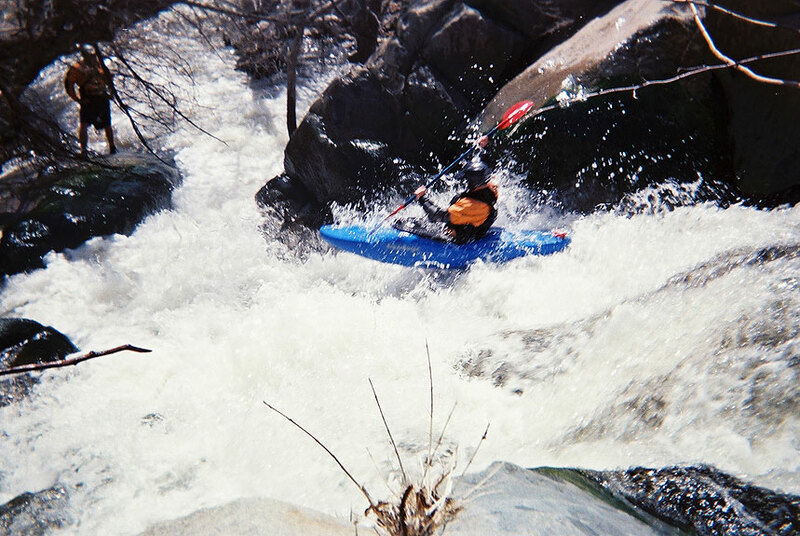 With a record-breaking California snowpack all of the Sierra rivers were bulging; so there was so much to choose from. 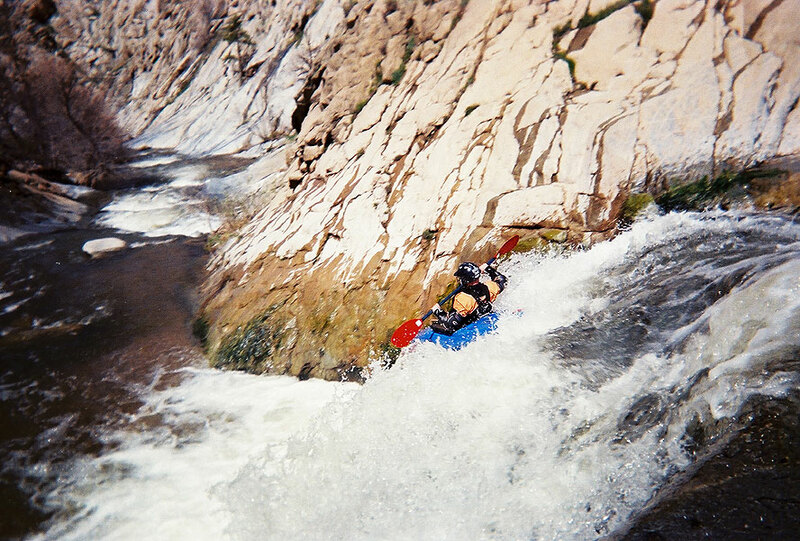 After some discussion we decided to run Brush creek that day, followed by the Tule that night. 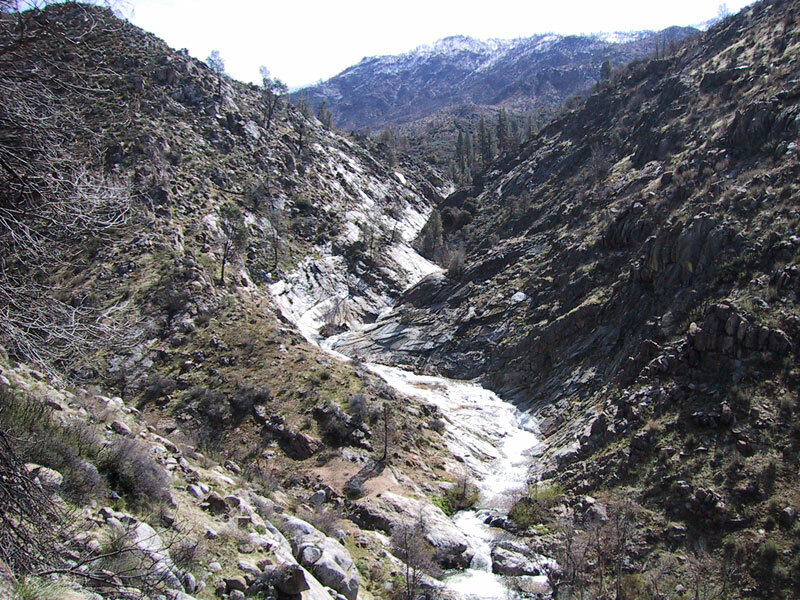 The day was everything we all dreamt of: Sunny, snowcapped mountains and high-quality Sierra steep creeking..
Brush creek is a tributary of the Kern River and is located just outside Kernville. You can stop at the Kayak shop in Kernville and check levels the day you run it, but there is no other gauge. On this particular trip Macy, Bob, Thad, Amanda and I all decided to run it a little on the high side. Macy said this creek can be run as low as 50 cfs. The flows this trip were around 250 cfs. 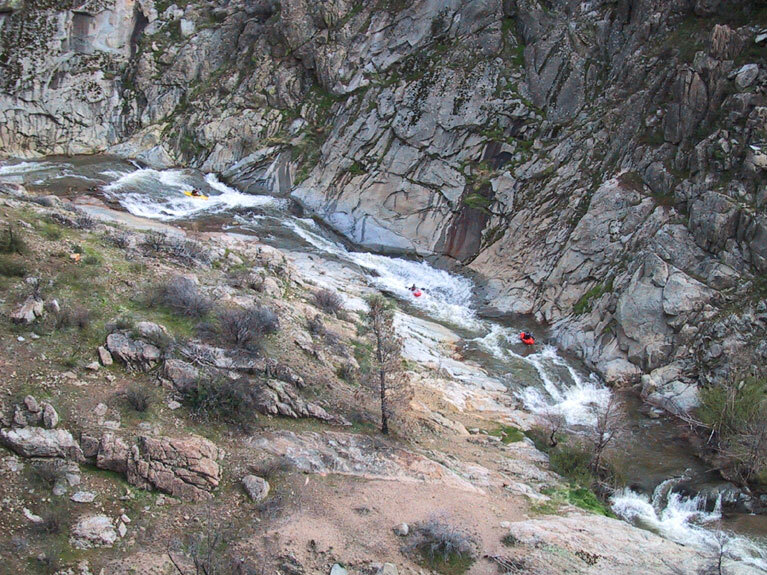 The take out at the confluence of the Kern River is a good spot to take a first look at the flows. There is a massive parking lot and bathrooms to change in. Brush creek was one of the finest creeks I have ever done (or at least the most fun..) The rest of the trip was a lot more rainy so we had one day of warm sun and fun and three days of rain, rain and more rain. The view up Brush Creek. To get to the put in, drive upstream, then turn east on the Sherman Pass road (J41). Turn off J41 within 2 miles, at a sign for a helipad. A small dirt road drops down to the creek here; you will need to hike down the hill to put on. This is the fun part. There are a few drops in the beginning to get warmed up on. Mostly fun little three to four foot boofs into tea cup shaped pools of smooth granite. Then you round the corner and the world drops away. 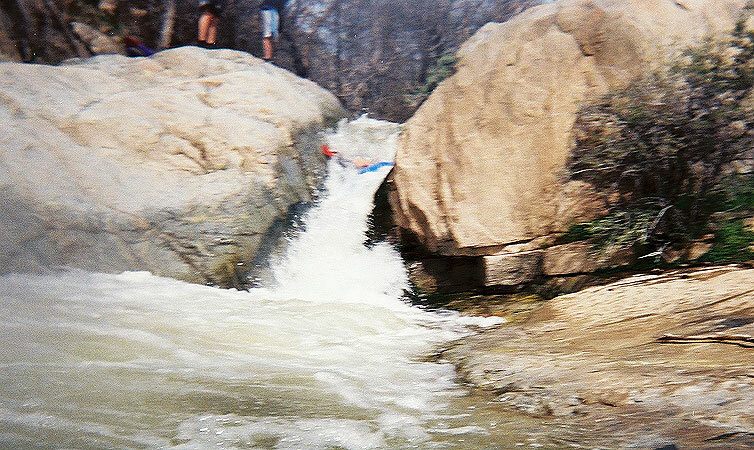 The first falls is a shallow 15 footer that you do not want to pencil in on. Amanda broke Macy's boat the first lap down on the drop so be careful. The drop is easily scoutable on river left. We ran far right on this day. From the first waterfall the next quarter mile the world just seems to fall out from under you. The gradient on this run is 360 fpm and it does most of that drop in the first half mile. There is another stair-step falls that is a ten footer into a fifteen footer. On this one you want to start left then work right for the second drop. After the stair step falls the run pretty much flattens out into some really cool slides and smaller drops. Macy, Bob, and the author running the slides downstream. The next major drop really manky. The "clean" line consists of a boof into a rock then a piton into the rock Macy is standing on, as shown below. Thad cleans up on the manky drop, with Macy downstream..
Below the manky drop are more narrow pool drops, then the notch. This is a very narrow chute that the whole river empties into. You can easily portage with a fun rock slide down the right or run the gut and get beat up a bit. Thad and Macy both ran the notch. Thad swam here with a self rescue. If you look real close you can see Thad in the notch.. The run mellows out a bit with some more slides and yet again more pool drops. When you hit the bridge you are at the take out, and if you are feeling good it's time to haul back up the helipad and do another lap! The first lap down this run with scouting and portaging, it took about two hours to get down. Once we knew the lines Bob, Thad, Macy, and I made it in about 25 minutes. When you don't have to get out of your boat this run really rocks! The falls section happens so fast you almost feel like you just jumped off a building once you reach the bottom..